The California Buttercup is a native perennial plant. 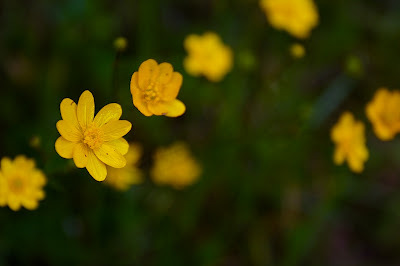 It is one of the most common flowers found throughout the bay area and grows most commonly in grasses near the edge of the forest preferring a moist habitat with moderate sun exposure. Each plant grows sprouts 3-4 small flowers, usually 1-2" in size. The plant itself grows about calf-high depending on the height of the grasses around it and may grow as much as thigh-high. It is one of the first flowers to bloom, often as early as mid-February and lasts well in to May. It is common to spot this flower in bunches often lining the edge of trails (trails tend to draw water drainage, perfect conditions for these flowers). Commonly confused with : Wild Mustard, Goldenfields, Sticky Monkey Flower. Look for them: In grasses at the edge of the forest. 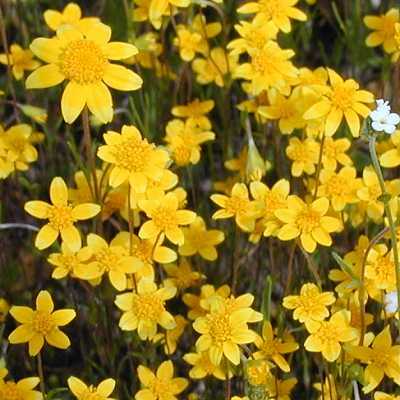 Native Uses: The California Buttercup is Poisonous but was used by the native Miwoks as a yellow dye after drying it out. I wish I did. I know i've seen that little guy before but I can't identify it sadly.